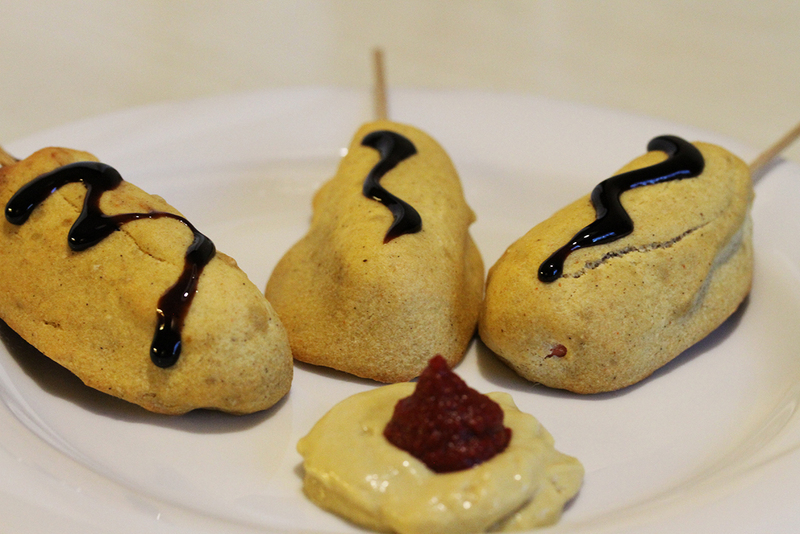 Quick and easy low-fat, gluten-free, vegan baked corn dogs. As a German, I never came across corn dogs before. However, when I was searching the internet for some fast food recipes, I finally discovered some corn dog recipes and wanted to have a vegan and gluten-free version. As I am not a fan of frying my food (yes, I know it’s fast food and needs to be fried), I was keen to try a baked, vegan, gluten-free corn dog variant! The actual problem was getting gluten-free, wheat-free, yeast-free vegan hot dogs … well, I found some that somehow tasted like plastic and used them for this recipe. But despite those slightly disgusting hot dogs, the final corn dogs tasted quite acceptable. I now need to find a good vegan, gluten-free, wheat-free, yeast-free hot dog recipe that I can use to make very very delicious corn dogs, but so far all those self-made hot dogs turned out too tender for corn dogs. Suggestions are welcome :)! 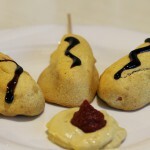 You may experiment a bit with the spices you add to the dough and serve the baked corn dogs with mustard and/or ketchup. Try whatever you like! Every March on the first Saturday of the NCAA Men’s Division | Basketball Championship is National Corndog Day – a celebration concerning basketball, the corn dog, Tater Tots and American beer, so be prepared ;). Preheat oven to 400°F (200°C) and line a baking sheet with parchment paper. In a medium bowl, whisk together cornmeal, flour, sugar, soy flour, salt, pepper, onion powder, cayenne, garlic powder and baking powder. Add milk and mustard and mix until just combined. Insert a wooden stick into each of the hot dogs and coat the dogs with the batter. Place the corn dogs on the prepared sheet and bake for 20 minutes.